The BBE Boxing Ring Timer offers time, rounds and interval settings. It's therefore perfect for boxing, training and studio classes. The Ring Timer features a traditional style metal casing design, offering clear visual and audio feedback. The BBE Boxing Ring Timer is more than only a boxing timer though it's ideal for martial arts clubs for sparring sessions to signal partner change over and also for commercial fitness studios offering group fitness circuits and circuit training to sound for station changeovers. Imagine having one of these boxing timers at home in your home gym for timing your rounds on your punchbag! It would be very motivational. Perhaps use to time alternating punchbag to skipping to press-up to sit-up and back to punchbag circuits etc. the possibilities are enormous and your exercise will be beyond intense ! 230/240v Mains Electricity powered with permanently attached plug and power cord. 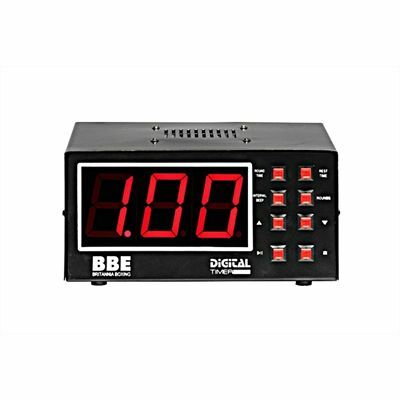 for submitting product review about BBE Boxing Ring Timer.